[AUTO]:[Counter Blast (1)] When this unit is returned to your hand from (RC), if you have a «Bermuda Triangle» vanguard, you may pay the cost. If you do, Soul Charge (1), and draw a card. Rio is an example some of the better artwork in the game, regardless of her rarity. She's one of the better units in her clan, too, rewarding and perpetuating Bermuda Triangle's central gimmick. With a single counterblast, Rio lets you soul charge 1 and draw 1 when she returns to the hand. This is usually done by way of units that soul blast, so there's a fair amount of synergy about the exchange. She does need to be fielded, however, and that's where many players, especially newer ones, fall into some traps. Rio only has 8000 power. This more or less requires Sedna's 8000 support (don't settle for less against anything but 10K vanguards!) to effectively score hits, and it also makes her easy attack bait. One should not spend more than 5000 shield defending her on any given turn, as it would outweigh what she draws close to 100% of the time. She also should never be in the back row, except during instances where there is no available booster for the column in question. It's not worth bogging down the power of your formation for a single draw. There's a small risk of deck-out as well should her ability be used too often, but only in longer games with many heals. Once you get past all this, there are some really awesome combos and pressure plays involving Rio. Lena is one of the easier bouncing methods, where Perla and Flores offer a more aggressive outlet for profit that won't require Rio to survive a turn or more on the field. Feeling lucky? Raindear is an option too. This is the type of card that does something very specific and well, but not as efficiently as you might think just looking at the card. If you take it at face value, Rio's ability is a +1 and soul charge for only the cost of a single counterblast, which is naturally amazing. However, she is part of a bigger ecosystem that is your deck, since she requires herself to be bounced back to your hand to use this ability. There aren't a ton of consistent ways to do this, which is a problem. The only consistent way that is around now is Weddell, one of the starting vanguards, who can pay one and stick herself in your soul to bounce a mermaid. The issue here is that, because you use Weddell, this ability combined with Rio's is really a +0 wash that only really exists to replace your starting vanguard with a better card when you have a booster to replace her with, and it costs 2 counterblast total. 2 counterblast for a wash that gets you a random card is significantly worse than the options other clans have, especially compared with cards like Conroe and Mecha Trainer. That leaves us with three other options. One is Perla, who can bounce Rio for free but needs to hit the vanguard for this to happen. This is already a pretty difficult condition to fulfill, but it gets worse. Perla has to attack last because her effect will bounce Rio, which would cause you to miss a chance to attack that turn if you bounced Rio before she got to swing, leaving her attack potentially even easier to guard than it would have been originally because of damage triggers. Perla also has no way to force more than 10k guard without triggers and is a big target for attacks and removal being in the front of the field. The next option is Tyrrhenia, a puny 5000 booster with essentially the same issues as Perla, minus the easy picking off with attacks. The last one is also the best one - Raindear's ability is essentially costless and allows Rio to reach her true potential as one of the cheapest +1s in the game. Rio herself, though, also falls into the same pits as Perla but is even more difficult to boost for good numbers, so no matter what she requires some sort of setup, but in the end it is worth it for the advantage she can generate. This one is a pretty interesting unit and fits with the theme of the entire Bermuda Triangle clan which allows you to send your rear-guards back to your hand to reassemble a new attack formation. With Rio here, this benefits you anytime you do what the singing mermaids do best! When Rio goes back to your hand, you Counterblast 1, Soulcharge 1 and draw 1. With the right combo setup, you can obtain a huge card advantage very early on in the game. Unfortunately, in a late game scenario, her mediocre 8,000 power will be easy for your opponent to retire and hard for you to get a hit in with her. With that being said, the fact is that while Rio’s power is pretty subpar, her skill definitely makes up for it as it helps you with getting more units to either make better formations with or have more in hand with to guard future turns. 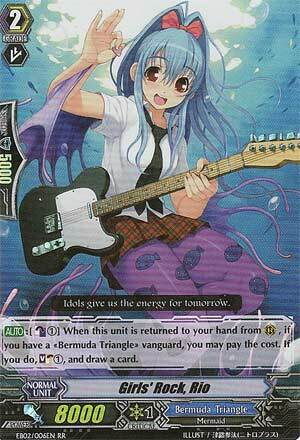 In conclusion, Rio definitely rocks and is an excellent addition to any Bermuda Triangle deck. Girls Rock Rio sports one of my personal favorite SP alternate artworks released thus far. Rio is key to the Bermuda Triangle’s bounce-then-draw mechanic, able to draw you an extra card each time she returns to your hand for a counterblast of 1 and a soul charge of 1. Her 8k power is a bit low for a grade 2, but, properly boosted, is able to hit some of those magic numbers out there, or at least make the opponent drop a guard or lose a rear guard before she gets bounced. The problem is that, once you ride to grade 3, you are able to play another unit with a 10k body with the same skill, effectively making Rio obsolete. That’s okay though, because she is still a 5k shield that can intercept. Girls Rock Rio is basically your earliest chance to get the bounce-draw mechanic started, and as such is worth a couple slots in a Bermuda Triangle deck. Rating: 3/5 – Can become much less useful after you’ve ridden to grade 3.